After the high-energy success of my first Preschool Dance Party last winter, I knew I needed to fit another dance party into my programming schedule. What better time than at the end of the summer, when kids have energy to burn after exhausting all their regular summertime activities? Once again, this dance party was an exemplary program. All of the children were engaged at a level comfortable for them--some marched around the whole time, some clapped from the safety of Mom's lap, but everyone got involved. 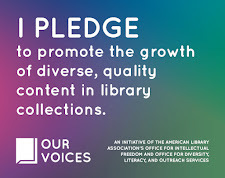 The program helped draw attention to two wonderful but often-overlooking collections at the library, our children's music CDs and our Rhymes and Songs picture books. Packing the fast-paced program with early literacy tips about the importance of singing and playing also helped caregivers recognize that reading isn't the only way to help kids develop early literacy skills. All in all, a great program (and a great workout for me). 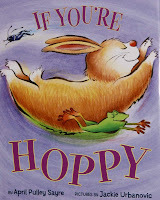 We used this song to get our bodies warmed up and break the ice for an atypical story time experience. We did lots of arm stretches and careful leg lifts to get everyone pumped. This song includes listening to hear the different motions to make. The kids' favorite verse was when they acted like chickens. 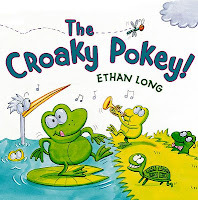 This silly variation of the Hokey Pokey is particularly exciting to kids, as they get to make froggy tongue-slurping sounds as they try to catch flies along with the text. I passed out rhythm sticks for this song, and we had fun trying to keep a beat, making our sticks sound loud and then soft, and trying to keep our sticks in rhythm while beating them behind our backs. The kids and I practiced our robot movements before I pressed play for this song, and then we robot-ed all around the room in a very stiff and silly-looking parade. This song wins the award for inspiring the most caregiver photos. 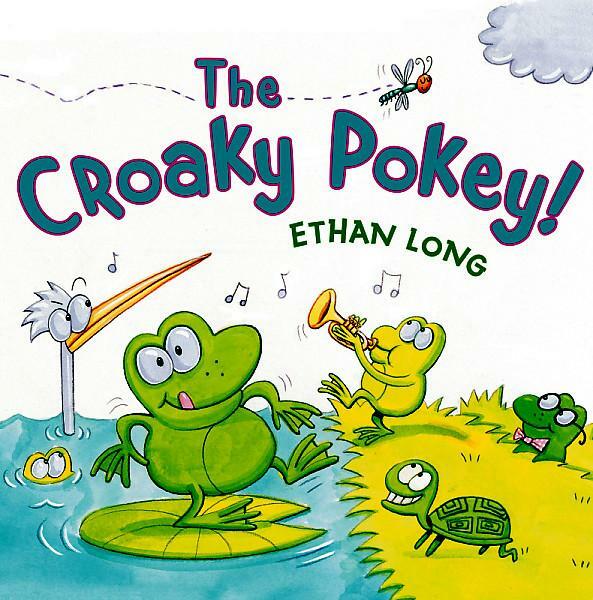 Each child got to choose a Beanie Baby animal to use for this song. The song instructs listeners what to do with their bean bags, including dancing with bags between one's knees. 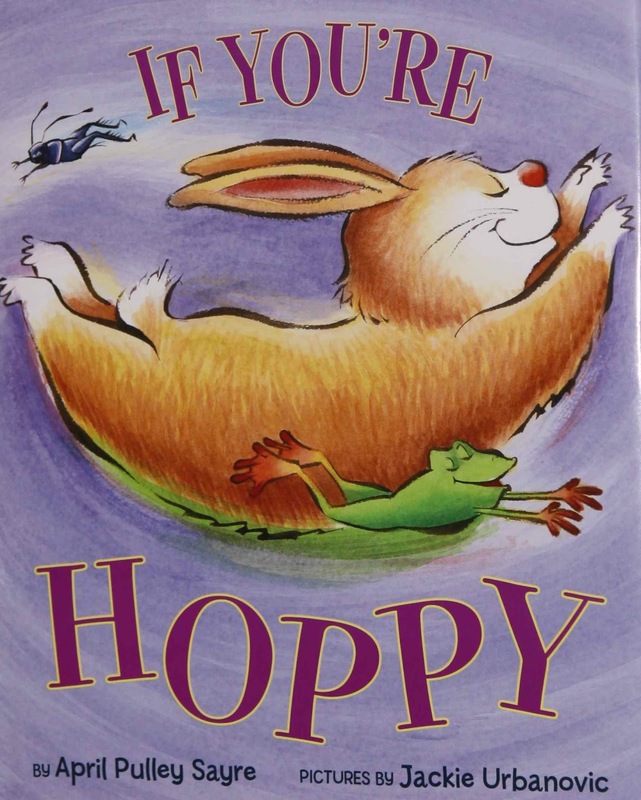 I stuck with the silly variation of kids classics book theme and shared this great animal-heavy picture book. Most kids opted to stay standing for the book, so there was lots of acting out the behaviors of the animals. We had a great time doing the shoo-ing motions for this song. As several of the kids were getting a bit tired at this point, we shared this song sitting criss-cross-applesauce on the floor, moving our arms and rocking to the beat. I pulled out the parachute for this song, and the kids and I worked on shaking the parachute at different speeds. We also worked on rotating the parachute in a circle using teamwork. I added some blow-up globes (beach ball-style) onto the middle of the parachute, which of course inspired much excited shaking and bouncing. We again used teamwork to count together and make the globes go really high, much to everyone's delight. When the song ended, I told kids to let go of the parachute when I counted to three so I could wrap the parachute up. Have you done a preschool dance party program? What are your favorite go-to songs and stories? As the final preschool program of the summer, I just did a Shake Your Sillies program where we read Giant Dance Party by Betsy Bird, Cha Cha Chimps by Julia Durango, and Dancing Feet by Lindsay Craig. Then we made and decorated shakers - folded paper plate, stapled together with with beans inside. Finally we danced to Joanie Leeds Everybody Jump. We had a terrific time and it was very well attended. Cybils 2013 Call for Judges! Uh-Oh, Co-worker is sick... Emergency Story Time!